The 41st president is greeted by about 300 well-wishers as his motorcade passes through Dock Square. 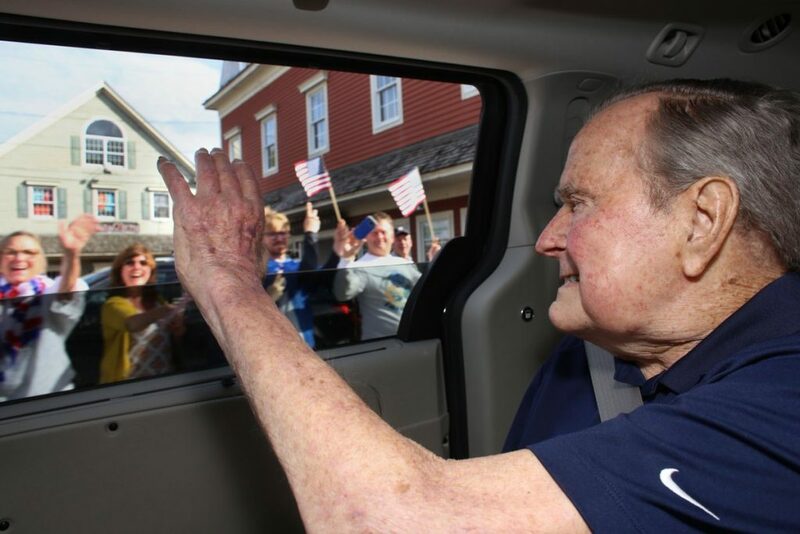 KENNEBUNKPORT — With cheering crowds lining the streets, former President George H.W. 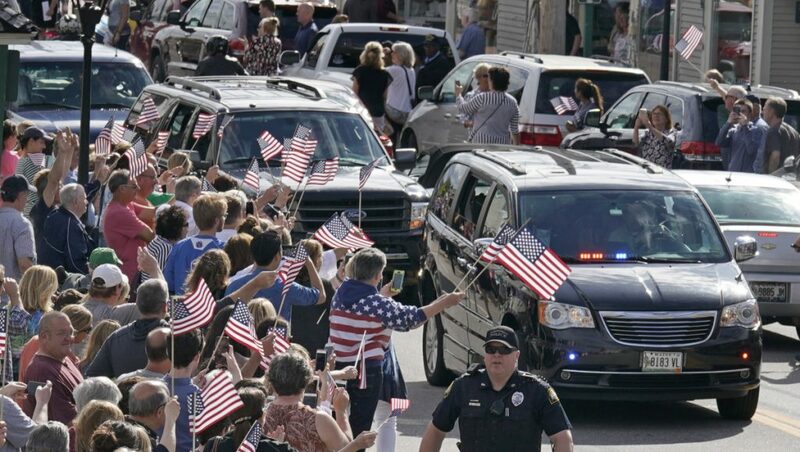 Bush arrived Sunday afternoon in Kennebunkport on the way to his family’s compound at Walker’s Point. The 41st president, whose wife, Barbara, died last month, waved to about 300 well-wishers as his motorcade passed through Dock Square at 4:45 p.m. People lined the streets clapping and waving American flags. The former president was sitting in the center aisle of a minivan, and he waved to people out of a passenger side window. Bush, 93, who served as president from 1989 to 1993, was hospitalized in Houston last month with a blood infection a day after the funeral of the former first lady. The Bushes have spent summers in Maine since the 1940s, and this will be the first one for Bush without his wife of 73 years. He held his wife’s hand in the hours before her death. “It’s where he’s spent every summer except 1944,” Jim McGrath, Bush’s longtime spokesman, said in a telephone interview late Sunday afternoon. Jeb Bush, Bush’s son and former Florida governor, tweeted a photo of his father looking out at the Maine landscape from the minivan. “My beloved dad is in Maine,” Jeb Bush tweeted. Members of Maine’s congressional delegation also responded to the elder Bush’s return to Maine. “We’re so happy you’re back for another Maine summer,” tweeted 1st District U.S. Rep. Chellie Pingree. McGrath said George and Barbara Bush typically spent May to October in Maine, so the former president is on schedule for enjoying a summer in Kennebunkport again. McGrath said the Bushes have always loved Maine people, and the location is perfect for large family gatherings at the Walker’s Point compound. The Bushes are well known in the Kennebunkport area for their neighborly ways, and in 2013 served as witnesses for the wedding of Bonnie Clement and Helen Thorgalsen, owners of H.B. Provisions in Kennebunk. Staff photo by Gregory Rec People wave flags and cheer as former President George H.W. Bush, in the lead vehicle, rides through Dock Square in Kennebunkport on Sunday. Mrs. Bush, who died on April 17, was known for her Maine philanthropy and as a tireless advocate for literacy. When visiting Maine Medical Center’s Barbara Bush Children’s Hospital, she would spend hours reading to ill children. The Bushes lost a daughter, Robin, at age 3 to leukemia. In the summer of 1943, before the Bushes were married, the former Barbara Pierce visited Walker’s Point with George, who would leave to serve as a pilot in World War II weeks later. They were secretly engaged that summer in Maine, and married on Jan. 6, 1945, in Rye, New York, while George was on leave from the war. Staff Photographer Gregory Rec contributed to this report.